Sorry for the photo, Red only available in Small and Large. 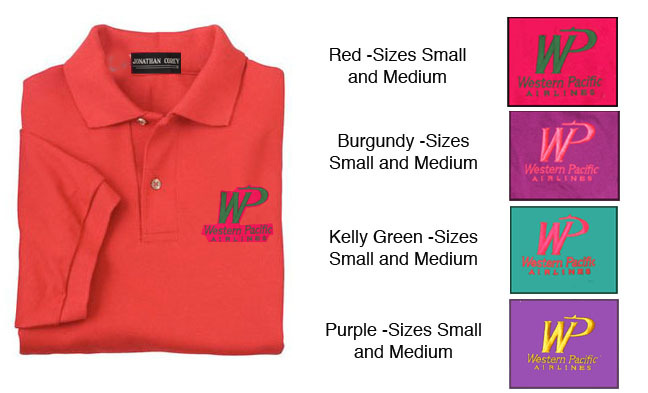 Skyshirts acquired a number of the high-quality polo shirts made for Western Pacific Airlines public contact employees. We picked up some of the shirts at their bankruptcy auction and we are passing the savings on to our customers! These Jonathan Corey pique Polo-Style shirts with long tails have the WestPac logo embroidered over the heart in matching colors. ; Number is limited of course, and orders are filled on a "first-come, first-served? basis! Only sizes Small Medium and Large, Great for larger kids too! Now at a super-low close-out price! They cost much more than this to the airline!